From the Editor: A year has passed since Response asked two alumni to share how they were navigating the harsh economic climate. 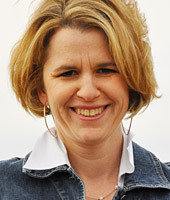 We checked in first with Jeff Keenan ‘83, and now we’re revisiting Jennifer Cooley Perrow ’90. Read Jennifer’s first feature, and then read her Response update below. It’s been a year since I wrote about our family’s quest to live on less, give more, and be content with what God has entrusted to us. Here’s an update. In July 2009, my husband’s father passed away after a lengthy battle with cancer. My husband’s mother had passed away just three years earlier, only weeks after being diagnosed with cancer. My in-laws were godly, faithful, hard-working, generous people. Their small but comfortable home was often filled with guests or visiting family members. They were remarkable people, and it’s still hard to believe they are gone. We spent much of 2009 packing up my in-laws’ home. We discovered years of bank records that showed monthly gifts to churches and missionaries. We unpacked closets full of well-worn, practical clothing. We saw with new eyes their most precious possessions, which were out on display: family photos and artwork by grandchildren. We kept meaningful items for family members, donated some items to churches and charities, and sold a few remaining pieces of furniture. Then, with heavy hearts, we sold the family home itself. When all was said and done, we walked away with some inheritance money. But we weren’t sure what to do with it: Was there a meaningful way to spend this money that had come to us at such a high cost? The kitchen in our 1940s home has not been updated in decades. We love to entertain and frequently have guests crowded around our tiny table, so we decided to remodel our kitchen and dining room with this inheritance. We know we’ll enjoy this updated space, and it feels like a fitting tribute to my precious in-laws who loved having friends and family members gathered around their own table. Yet we’ve faced multiple, perplexing questions along the way: How much should we spend? How can we get quality products without paying top dollar? Should we do the work ourselves? Is it right to spend money on a remodel during this economic season? We’re aiming to be good stewards of our inheritance. We’re doing most of the labor ourselves, but when we do hire help, we employ people who need the income. We purchase fixtures on sale, and look for bargains at every turn. And when it’s done, we’ll delight in seeing family and friends gathered around our newer, bigger, dining table (purchased on clearance, of course!). While my husband, Dan, tore the kitchen apart in June, the kids and I headed to St. Louis, Missouri, to visit family friends who pastor a church in the inner city. We had the privilege of both observing and participating in their amazing ministry to the poor in their neighborhood. We visited Rebecca, a 9-year-old girl recovering from third-degree burns she received while cooking dinner for her brother (mom was at work). We also met Jamana, a newly arrived Nepali refugee, who makes jewelry to earn money for her husband and infant son. We returned home with a new passion for helping the poor in our own city. We know there are people just like Rebecca and Jamana not far from where we live — we just need to find them. I’m hopeful that in the fall our family can get involved with a refugee ministry here in Seattle. I wish I had this figured out — how much money to spend, save, or give away. I wish I knew the most effective way to help refugees. I wish I were less selfish and more generous — less concerned with the color of my new kitchen tile, and more concerned about helping those in need. But I’m so thankful for a God who sticks with me through it all, who patiently walks with me as I continue to wrestle with these issues.